PSC has come out with a new steering box for the jk that claims no hydro assist is needed with tires up to 37s and is quite a Bit stronger. Gonna look at that so I may not need to do hydro. Sorry RockcrawlinJK, I have to be honest with you. I love seeing your posts, cause your avatar is HOT!!!! I have often wondered who that is. Well sad day. The jeep failed to start today. Had to call my wife and have the Tacoma jump start it. I knew the battery was gettin weak but thought it was better than it was. Went and picked up an orileys super start platinum AGM made by east penn. The jeep starts better than it has ever done. I also ordered my axles from carbon off road and they will ship out after KOH. I will message him again tomorrow when I get to work. Just ordered the from bilstein 5100. I have the rears already, Almost there. I know it's just me all alone on this one. Pretty much. I went cheap for now. I want to eventually run a coilover in the front. I just pulled some Rancho 5000s off the Jeep and installed some Fox's. Ride is much improved. I actually preferred the ride of the Bilstein shocks on my 4Runner on the street, but they didn't control it off road at all or when it was loaded. 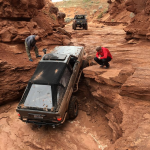 The thing drove like a boat loaded up and bottomed out constantly in Moab. If I was on the street running empty they had a fantastic ride. I drive on the street more then I wheel it so that is fine. I bilstines on my old truck and liked them. Sounds to me like you didn't have enough shaft exposed at ride height. Maybe, but the Ranchos I am running are almost dimensionally identical and pretty eliminated the issue. The Bilsteins really did a poor job of controlling my suspension at slow speeds. Lots of flopping back and forth along with bottoming out. I have no doubt that a Bilstein could be calves to work well, but in my experience the 5100s from Marlin were not a good solution. It'll be cool when I feel like I need to bring the 4Runner when we hang out. The Civic handled itself well today! got bored yesterday and started priming my bumper. switch panel came for the A pillar. my arb switches will go here and light bar when i get one . I can also do one more small toggle on this for rock lights. Shafts are finally ordered. They are not selling them to the public yet since they need to test all aftermarket housings for length, seal surface and all that. Lucky for me I have been in touch with them for a while about ordering a set and they sold me the first ones available for my pro rock. Page created in 0.365 seconds with 44 queries.